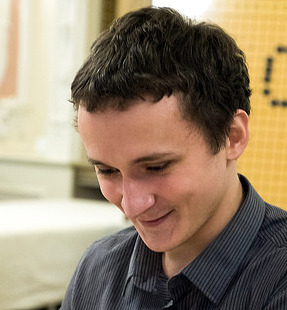 Artem Kachanovskyi (right) prevailed over fellow Ukrainian Andrii Kravets in the final of the third European Pro Qualification tournament to become Europe’s latest professional. Sixteen players competed on the weekend of March 5-6 in Baden-Baden to become the next EGF professional. The tournament featured a double elimination to determine a final eight, who ten competed in knockout rounds. The tournament started well for French players Thomas Debarre and Benjamin Dréan-Guénaïzi, who beat respectively Andrii Kravets (Ukraine) and Jan Hora (Czechia), and then Juri Kuronen (Finland) and Csaba Mero (Hungary), advancing to the quarterfinals. Tanguy Le Calvé (France), who lost to Lukáš Podpera (Czechia), entered the repechage, where he could again hold his head high after wins over Lukas Krämer (Germany) and Juri Kuronen (Finland). 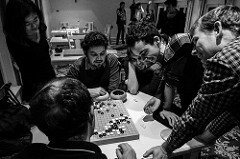 On Saturday afternoon, the quarter-finals saw Debarre lose to Kravets in a repeat match and Tanguy fall to Kachanovskyi. Debarre beat Viktor Lin (Austria) but then on Sunday morning he lost in the semi-finals to Kravets. The two Ukrainians then met in the final where Kachanovskyi emerged as champion. Full results can be found on the EGF website, along with player bios and tournament photos.